Ice-climbing started in the early days of mountain climbing when mountaineers encountered the frozen water in the gullies and on mountain faces. However, it never became a sport until the early 1970s when the modern ice tool was created. This is not a simple sport that can or should be taken lightly. 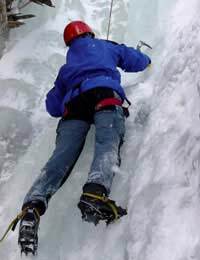 Before you even get near an iced up mountain, you must develop your overall climbing skills, including knowing how to comfortably belay, tie into the ropes as well as have mastered basic climbing manoeuvres, all of which can be practised on indoor climbing walls, as well as outdoors, during the summer. Hire an instructor specific to ice-climbing. The instructor can help you develop your climbing skills in a controlled environment. The instructor will educate you on knots, ice-climbing safety, ice-bouldering, belays, anchors, top roping techniques, multi-pitch climber as a follower, as well as ice and avalanche hazard evaluation. Some of the necessary pieces of ice-climbing equipment include ice-tools, a helmet, harness, warm clothes, several pairs of gloves and technical climbing gear (rope, ice screws, etc). "Crampons [ice picks on the bottom of your boots] need full contact with the ice to be effective; ice axes need to be solid, like an axe in a block of wood; and body position is everything," according to ice-climber Darryl Leniuk. It is also important to find a climbing partner or be willing to hire a professionally certified guide each time you want to climb, as you never want to climb alone. Not only is it more enjoyable to climb with someone else, it is a safety precaution to always have a skilled partner with you. Ice-climbing is not for the faint of heart or beach bunny. In order to climb the mountains, it obviously has to be cold outside - on average at least -20 Celsius. One common side effect of ice-climbing is something called the screaming barfies. This is when "warm blood returns to your hands after gripping ice tools in cold weather," according to Leniuk. "The effect is so painful that you may want to vomit." But it does go away, and rarely, if ever, causes any damage. The best ice routes tend to form in narrow canyons and gullies, which, unfortunately, are also in avalanche territory. Therefore, climbers need to have backcountry knowledge. The avalanche terrain exposure scale (ATES) is used for rating avalanche danger and is based on snow stability - which changes with the weather - day-to-day or hour-to-hour, according to Parks Canada. "Avalanche terrain ratings and daily avalanche bulletins must be used in combination for evaluating hazards and selecting ice climbing locations," according to Parks Canada. Complex - routes with frequent exposure to multiple overlapping avalanche paths or large expanses of steep, open terrain; multiple avalanche starting zones and terrain traps or cliffs below. In order to stay safe, Parks Canada suggest, "take a recreational avalanche course, carry appropriate rescue equipment, climb with solid partners and recognise the limitations of your knowledge."